A long time ago, before she retired (I'm so old all my doctors are retiring), my previous dermatologist told me to wear sunscreen: SPF 15 in summer and 50 in winter. I never found a 50 that I liked on my skin, but I've been good about the SPF 15 year-round. 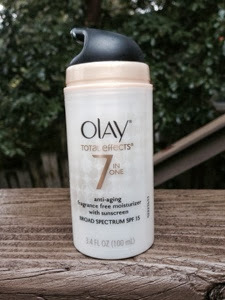 What made it so easy is Olay Total Effects SPF 15 sold by Costco. I wore this before finding it at Costco, and was thrilled to find it there. Costco's price is good,; and, often, you can buy it with a coupon to reduce the price even further. At one point, a few years ago, Costco stopped carrying this with the SPF, and I had to purchase it at the drugstore, where the price was almost double. I've tried more expensive moisturizers and less expensive creams; this is the only cream that feels right on my skin and doesn't smell weird. On the label, Olay Total Effects claims to be fragrance free; not sure about that, but the slight smell (which might be only in my imagination) disappears quickly. Does it work? I do occasionally get compliments on my skin. Usually after spending $$$$ at my new dermatologist's. I don't think the sunscreen hurts. Why are these recipes on your blog? ©Jeanne Rambo Brooks 2013 All rights reserved. Simple theme. Powered by Blogger.